The Joint Liquidators of Farepak have today sent cheques to Farepak’s agents and customers. Below are some answers to questions you might have about the amount you were owed by Farepak or the cheque you have received. What is the cheque that I have received? The cheque is a final payment in relation to your claim in the Liquidation of Farepak. How much have I been paid? You have been paid approximately 35p for every £1 you were owed by Farepak. How is the amount of the cheque made up? The sum of money on the cheque you have been sent is made up of two parts: • A payment, known as a dividend, of approximately 14p in the £ from the Liquidation. • An ex-gratia (voluntary) payment by Lloyds Banking Group of approximately 21p in the £. Why have I not received all of my money back? When Farepak collapsed, there was no money in its bank account to pay back the agents and customers – known as ‘creditors’ – who had been saving money. As a result of the work done by the Liquidators, enough money has been recovered, in addition to the voluntary payment by Lloyds Banking Group, to send you this cheque. Will I get any more money? This payment represents all the money that is available to pay to Farepak’s creditors, which includes agents and customers. You will not receive any further payments. How was my claim worked out? Your claim was worked out from the forms you and your agent previously filled in and returned to the Liquidators, and from looking at the information that was in Farepak’s records at the time Farepak went into Administration. Can an agent or customer provide new details of their claim now? The claims have been finalised so it is not possible to provide new evidence now. If new claims are made now we will not be able to pay them. What has happened during the Liquidation? When Farepak collapsed, there was no money in its bank account to pay to its creditors, which includes agents and customers. As ordered by the Court and approved by Farepak’s creditors, including agents and customers, a Liquidation Committee was set up. This is a group of people who were owed money by Farepak and who represent all those who lost money as a result of the collapse of Farepak, including representatives of the agents and customers. As directed by the Liquidation Committee, we have been working throughout the course of the Administration and Liquidation to recover as much money as possible. The Liquidation Committee asked the Liquidators to do certain work, including taking legal action, to try to get money for the benefit of Farepak’s creditors, including agents and customers. This work can take a long time but is now finished. As a result of the work done by the Liquidators, enough money has been recovered to send you the dividend payment of approximately 14p in the £. In addition the Liquidators have sent out an exgratia (voluntary) payment by Lloyds Banking Group of approximately 21p in the £. How long do I have to bank my cheque? You will need to bank your cheque within 6 months of the date on the cheque. I have changed name so cannot bank the cheque. What should I do? Please send your cheque back and send us evidence of your change of name, for example a copy of a marriage certificate. These should be sent to: Claims Management Team, Farepak Food & Gifts Limited – In Liquidation, PO Box 3404, Swindon, SN2 9EQ. We can then arrange for a replacement cheque to be sent to you. A Farepak agent/customer has died. What should I do? In order for a new cheque to be sent to the agent’s or customer’s next of kin, please return the cheque and provide a copy of the death certificate. These should be sent to: Claims Management Team, Farepak Food & Gifts Limited – In Liquidation, PO Box 3404, Swindon, SN2 9EQ. We can then arrange for a replacement cheque to be sent to you. I have read about a further 17.5p paid by the Farepak Response Fund in 2006, bringing the total paid to approximately 50p in the £. What is this? Some vouchers and hampers were sent out by a charity called the Farepak Response Fund in 2006. The Joint Liquidators were not involved with this process and have no more information on it so cannot help further. Unfairpak wish to clear up in-factual information that is being put out into the World Wide Web. All Agents of Farepak receive an Annual Report each year it is a shortened version of that which is sent to trade suppliers and former employees of Farepak. The Agents are asked to show their customers said Reports in order to keep the costs down. Alternatively, if customers have access to the internet, they can download these reports at www.farepak.co.uk . If you were an Agent and are still receiving Annual Reports then your claim is registered! You only need to notify The Claims Management Team if you have changed your name or address. You need to write to Claims Management Team, Farepak Food & Gifts Limited – In Liquidation, PO Box 3404 , Swindon, SN2 9EQ with details of your new address or new name. If you have been married send a photocopy of your marriage certificate. If your are the next of kin of an Agent who has sadly died, please send a photocopy of their death certificate to the Claims Management Team. 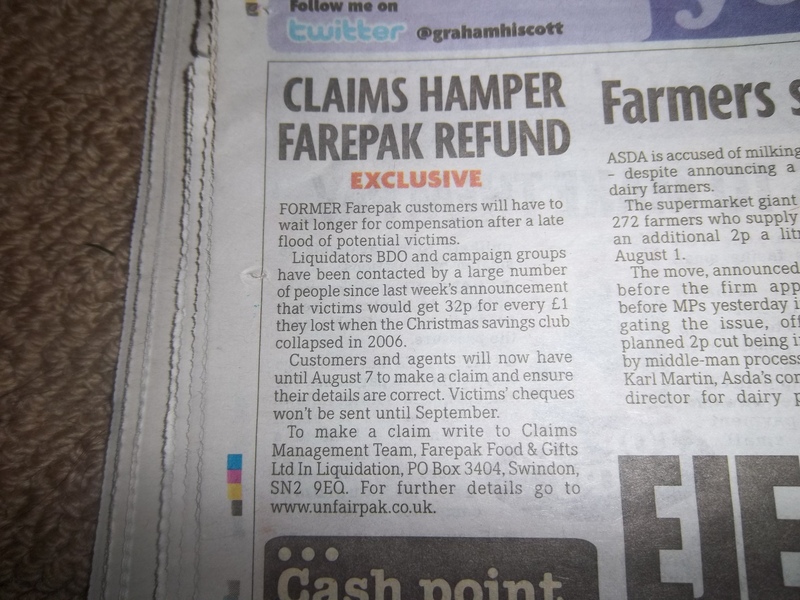 If you were a customer of Farepak, please check with your Agent that they submitted your claim in 2006/2007. If your Agent confirms that they did and you have not changed your name or address since 2006 then you have to do nothing. If you have changed your name or address since 2006 you need to write to Claims Management Team, Farepak Food & Gifts Limited – In Liquidation, PO Box 3404 , Swindon, SN2 9EQ with details of your old address and new address. If you have gotten married you need to send a photocopy of your Marriage Certificate. If sadly, you are next of kin of a customer who has died, then you have to send a photocopy of the Death Certificate to the Claims Management Team. Unfairpak are fully equipped to deal with all matters relating to Farepak and we can answer all questions in respect of same. The difference between Unfairpak answering questions and the Claims Management Team is the fact it saves time and money. The Claims Management Team are inundated, as are Unfairpak. However, Unfairpak works on a purely voluntary basis and by contacting us you are not adding to the costs of the liquidation. If people are advising you to write direct or in fact email people at BDO, these people are actually causing you to incur costs in respect of the liquidation. Again, Unfairpak would stress that we have a direct line to BDO and if we cannot answer your question ourselves, we can have a response within basically an hour to your question. Regarding the non receipt of Farepak Response Fund vouchers prior to Christmas 2006. Please DO NOT submit a claim to BDO. This is false and inaccurate information which is being given out. The issue of the non receipt of vouchers is being looked into and Unfairpak should be in a position next week to advise in respect of same. What Unfairpak would like to point out is the fact that it was vouchers that were sent out prior to Christmas 2006 NOT cash. Accordingly, please think back and ask yourself “did I receive vouchers from my Agent prior to Christmas 2006”. The vouchers were Love 2 Shop vouchers and were distributed registered delivery by Park Group Plc. If there is anything we can do to help, please ask. As we have stated, if we cannot answer your question directly, we can have a response, during normal working hours, within an hour at the latest.